The proposal has been under discussion between officials from the Port Authority, the Allegheny County Executive, the city’s likely next mayor — City Council Member Bill Peduto — and a group of downtown business owners. It would involve rerouting all city bus routes that terminate downtown into a tight circulator route around the core of the city. Bus riders would walk the remaining blocks on foot. People who ride buses are total losers, so the businesses in downtown Pittsburgh don’t want them hanging out in front of their properties. Public transit has a 38.4% mode share in downtown Pittsburgh. That is pretty good for an American city. If it ain’t broke, why fix it? But Peduto says the plan could improve bus service. 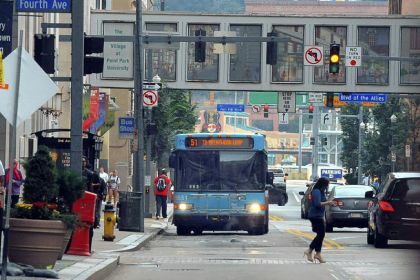 Because Pittsburgh’s actual downtown area is fairly small, he says, a circulator route would generally put bus riders within three blocks of their destinations and would eliminate the need for buses to turn around downtown. Peduto, who has impressed national transportation advocates with some of his ideas on transportation, also indicated that the move could be the first step toward making the central part of downtown totally car-free. Elsewhere on the Network today: Transport Providence presents a “conservative case for transportation reform in Rhode Island.” UrbanABQ makes a compelling argument for a road diet in Albuquerque. And Reinventing Parking examines the oft-cited statistic that 30 percent of traffic is drivers searching for a parking space.